The recent news that a private collection of Hemingway works has gone to the University of South Carolina brings to mind the location of that very beautiful university library. The land on which the University of South Carolina’s Thomas Cooper Library sits was the parade ground of the U.S. troops when they were stationed in Columbia after the Civil War. Everyone who teaches Reconstruction knows the powerful significance of the federal troops in Columbia. 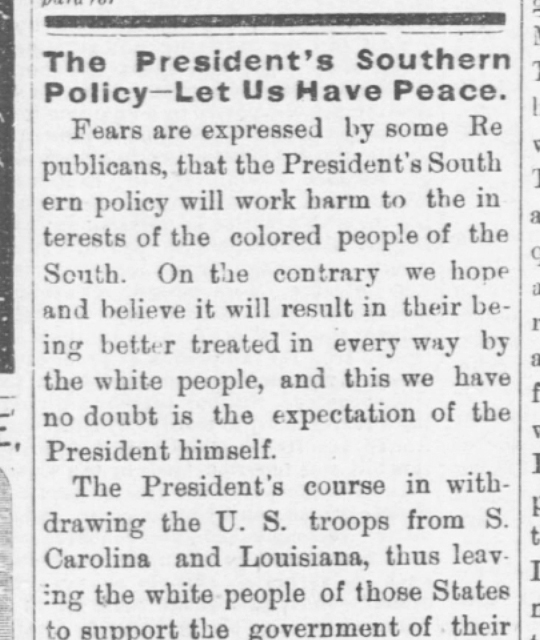 Indeed, the idea that President Rutherford B. Hayes removed the troops from the South in 1877, an “event” that many Americans believe ended Reconstruction, is based on the Columbia troops. 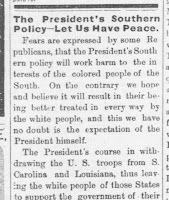 That Hayes removed the troops from the South in 1877 is incorrect. What he did was to order the U.S. troops stationed in Columbia to move away from the South Carolina State House, where they had been protecting the Republican governor from mobs determined to install Redeemer Wade Hampton in the governor’s chair. The troops pulled away, Hampton became governor, and Republican rule in post-Civil War South Carolina was over. May 03, 1877, Ohio, p. 1. Until I actually saw the proximity of the State House to the parade ground, I really didn’t understand just how small the scale of this event was. In the 1870s, you could all but throw a stone from the troop barracks to the State House, and the four blocks between the two were mostly fields. When the president “removed the troops,” they simply marched back down the street. It probably took less than ten minutes. 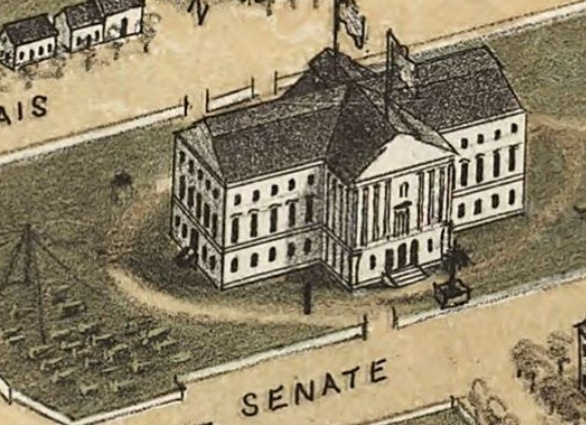 On this wonderful 1872 map, the State House is obvious in the lower right corner; the parade ground is to the left of the number 30, which is the army barracks. The map can be expanded and manipulated. Doing so makes it hit home just how small a town we’re talking about when we talk about the fight over the South Carolina State House during Reconstruction. This is so interesting, Heather, the way space and location inform the understanding of history--usually in the direction you indicate, from grand to something a bit less. (Like baseball, maybe, History is a game of inches after all.) After reading about Benjamin Church's daring (self-reported) exploits in King Philip's War, including his capture of Anawan by scaling down a rocky precipice, I visited the site in Rehoboth, today's Anawan Rock. I was thinking El Capitan and got, well, something less. It caused me to go back and read Church's tale from an entirely different perspective! History is a game of inches. Wow. That's great! And you're right: seeing just how small some of these "events" were, and how big they are in textbooks, makes you have to rethink history and its construction. I have found great videos on the internet (sometimes home videos that people have uploaded) of historical sites I have never seen, and at some level I'm always a bit shocked that the places really exist... and are just normal fields or rivers or rocks. Places of historical significance seem like they should be Very Special. I grew up around the corner from Anawan's rock. It's not the only half-exposed piece of glacial debris in those woods, or the largest. But maybe it also depends on context -- on when you see the thing. I saw Stonehenge right after the sun had set. I jumped the fence and went in all by myself (my British hosts waited at the car, they didn't care much about the old rocks -- but, we were pub crawling). Sitting on the fallen "altar" stone as the light faded was quite cool. I was glad I hadn't seen the place during daylight from a tourist's distance.